The Alzheimer Society is putting hearts, minds, and hands to the inspired role of helping those diagnosed with dementia and Alzheimer’s, as well as the people who love and care for them. In partnering with the charity we are excited to share that thousands of your donor dollars are being directed to the work of support and research related to this disease. “Dad has been moved into a nursing home.” These are familiar words as our senior donors navigate the unsettling life change of relinquishing their car keys, or as families do the emotional work of managing a loved one’s estate. Letting go is not easy, and your role in supporting your Mom or Dad with what feels like the loss of independence is a weighty one! Stories of the old jalopy that was used to teach the kids to drive, a motorhome that travelled coast to coast, and the boats that have given several generations many joyful memories shout reminders of the heart, humor, and love that the independence of a driver’s license and a set of keys can afford. It can be a healing and heartening thing to honor Mum or Dad by seeing their old car’s next ride benefit a charity that has been meaningful — a testament to the memories and relationships their vehicle represents. Just this Spring and Summer a few of our Alzheimer Society donor families have had some exciting outcomes on behalf of their loved ones: A 2011 Cadillac provided a $14,195.00 gift to Alzheimer Society Toronto. The Ottawa chapter received $9853.36 for an ‘09 Econoline, and just under $3000.00 was sent to AS in BC for an ‘07 Calibre! Interested in learning more about the support that is available to your family through the AS? Visit them here to learn about early stages of Alzheimer’s, strategies for living well with the disease, and the ongoing efforts of the charity. If you can relate to this transition, and would like a little extra help with taking care of the ins-and-outs of arranging for the family car to find it’s new home, we can get everything set up for you from this side. Our agents will be sensitive to your particular situation, and to the needs of your loved one, while capably arranging your free tow. 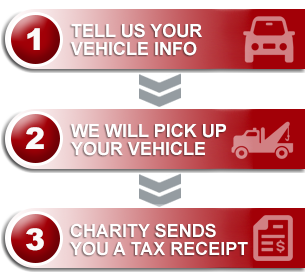 From there it’s just a matter of sending the donation on to your family’s chosen charity as we honor Mum or Dad by seeing their donated vehicle go on to help, teach, or contribute to research!